This is a library of 1000 effects and variations for any shapes and elements which will save you a lot of time and help you professionally edit your video in a matter of minutes. 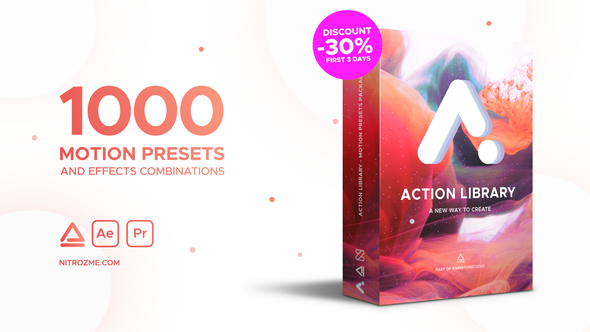 Action Library contains all types of ready to use effects from 7 different categories: Scale, Fade, Pattern, Matte, Glitch, Distortion and Color Shift. Every category contains different types of effects and creates unique stylish look. Apply a preset in one click. We will frequently update Action Library and add more categories and effects. Over 1000 effects&presets for any layers. This toolkit is perfect for editing titles animations. Action Library contains all kinds of editable effects: Glitch, Shatter, Particles, Displacelement and many other. It can be used for any type of video: wedding, vacation gallery, photo albums, anniversary, birthdays or other special events. Combine several effects at the same time to create any style you want: minimal, clean, lovely, inspired, travel, corporate, business, elegant, christmas, birthday, vacation, urban, glitch, sport, modern, vintage. Dear friends! Videohive Authors that bought the regular license are allowed to use these presets in their video-templates. Our product will help you create a new unique design and save your time. If you will use our project in your templates on Videohive, please add this banner with the link in your description. Also, please, notify us about it and we will add your icon into this description. Thanks!